We don't have a great many vintage items in our home. A nice Meakin coffee set, my grandma's old Robert's radio and a few jugs and other bits - things that I've bought or have been given to me over the years - but not as much as you'll find in other homes. I love vintage things, furniture especially, but don't have the patience to scour charity shops, car boot sales, ebay and antiques fairs for that perfect piece, that amazing bargain. I know, it's a major failing of mine. I'm seeking help. So this month's theme was a puzzle for me until, while staying at John's parents' house in Durham recently, I looked anew at this toy. Now, I don't know for sure when it was made but I'd guess it was in the seventies. I can't think when else brown, orange and yellow were used together so much and with such good effect. This boot-shaped dolls house was bought by my mother-in-law for a couple of pounds in a charity shop a few years ago, and is part of the collection of toys that live under the bunk beds in the spare room, ready to be played with by visiting grandchildren. It's seen better days and is missing a few pieces I think, but Bella and Angus love it and play with it every time we stay at their house. When I first saw it I had such a strong feeling of nostaliga. I don't think I ever owned this toy but I certainly remember playing with it, perhaps at friends' houses. But what surprised me was when John's mum told me that he had one as a child. And when I looked for photos of the original box online, it showed a boy (in a blue polo neck jumper) playing with it on the packaging. That made me even more nostalgic because I think that if a play boot like this was on the market today (and I'm sure there are a few) it would be pink, purple and glittery. It would involve fairies and princesses and would certainly be marketed firmly at girls. That doesn't mean boys can't and wont play with toys aimed at girls, but I wish toys could just be toys, not "girls" toys and "boys" toys. It's everywhere once you start looking, this division between what each gender are told they should play with. And it's hard to fight. You can avoid it when you have babies and toddlers; you can buy all the beautifully made, tasteful, gender-neutral, ethical wooden toys you like and your children will love them. But wait until they start nursery and school. I found that within a few months of joining nursery Bella was certain that pink was her favourite colour and suddenly knew the names of all the Disney princesses. She'd turn her nose up at certain toys or colours saying they were "for boys". At four, Angus happily plays with the doll's house, kitchen and shop and I hope he continues to do this for many years because, well, why shouldn't he? I love the strength and boldness of these colours. They are vivid and assertive and fun, and just say "play" to me and nothing else. There is nothing insipid here, no pastel pink or blue. 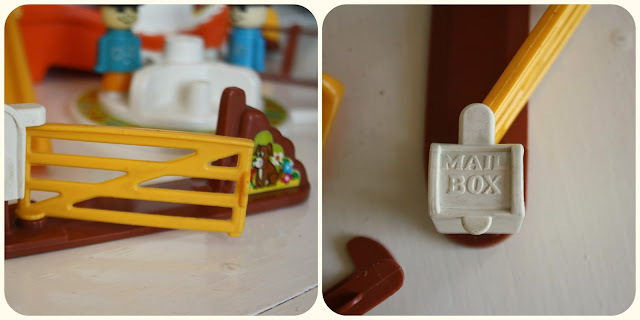 So there's another reason to buy vintage rather than new, if you needed one - instead of toys marketed "for girls" or "for boys", we had toys that were aimed at children. What is The Colour Collaborative? All creative bloggers make stuff, gather stuff, shape stuff, and share stuff. Mostly they work on their own, but what happens when they work together? Is a creative collaboration greater than the sum of its parts? We think so and we hope you will too. We'll each be offering our own monthly take on a colour related theme, and hoping that in combination our ideas will encourage us, and perhaps you, to think about colour in new ways. We're excited by where this might take us, click on the logos below to find out! Three cheers for toys for children, not just girls or boys. I, too, have a boy and a girl (university age now) and the toys that were marketed for them were just nauseating. All glitter and glitz for girls, and all violence and mayhem for boys. But I agree, once they start school that's the way of things. It makes me understand why so many people homeschool their kids. Yes, yes and yes. I wish it had occurred to me to look for vintage toys for my daughter because the pink tide certainly made me feel sick. also toys were obviously built to last in the 70s. Not sure that I remember this either, but, I sure wish that I had had one when I was little. I had lots of other nice things, but this looks like I would have loved it when I was your childrens age. Hope they continue to play and enjoy for a long time. I really enjoyed this post and I totally agree about the gender thing, I very nearly wrote my dissertation on the whole gender and stereotyping business in childhood and education! Why do they have to go to school? It's all downhill from there! Hope France is glorious, and you are having a wonderfully relaxing time. I remember this boot so, so well! My sister had it and I remember it all (now I see it again) the orange and yellow, the little gate and the letter roundabout. It takes me straight back. And yes, 100 times yes on the toys for children. I agree completely and I have said it so many times myself. Surely in these times of equality we should be moving far far away from the dolls for girls and cars for boys mentality. It baffles me and yet, seems so hard to fight. I'm proud to say my Little Miss has many cars, trains, a scaletrix set and plenty of lego, which are all more popular and more played with than her dollies, but birthdays always bring plenty of pink, glitter, magic pony, sparkle cat, purple, play things. But why did they have to bring out pink lego kitchens etc. My daughter was far happier with the police station!! As a child my son had a toy kitchen (marketed for girls) which he loved, he's 24 now and a fantastic cook. His elder brother had a toy hoover, sadly the interest in that activity disappeared as he got older! Lol, I remember taking my youngest son with me when I helped out setting up a school fair. He was no trouble having found a toy hoover to play with - which I then had to buy for him as he loved it so much!! Needless to say he has not kept up his fascination either! What a fantastic post! I really love this toy and would love to play with it actually! My daughter's childminder has quite a few really cool vintage toys which her own children had and my girl just loves playing with them. Ohhhh - I think I may of had one of these. ..the little old lady that lived in a shoe! I absolutely agree! I have two sisters and we played with footballs, toy garages and cars as well as Sindy dolls too. I wish that today's toy manufacturers wouldn't use such stereotypical colours. They had it right in the seventies, judging from this boot! I do remember hankering after a dolls' house in the shape of a tree, and a big yellow teapot with a teacup car! Do you know, now I see it, I think my cousin had one of these. And it is gender neutral, you're right, in large part because of it's colours. How refreshing! Do you think it being somewhere to live and a means of travel also contribute to it's boy and girl appeal? A great post. You are so right, pink shouldn't be hijacked by girls, and everything for girls shouldn't be pink. They should be able to play with cars and trains if they want. My little boys loved kitchens when they were small. Loved them. I hate the whole Disney princess thing, it sickens me. There is far too much commercialism when it comes to children's toys now. And the toys do far too much. Simple is much better I think. Then there is room for imagination. Great post, you are right about colour coded toys. I don't remember anything being pink when I was a child. I have tried really hard to not have too much pink in our house and I am largely succeeding as my eldest is a boy. Kari is right that it is easier when you homeschool. Thank you!! I always say this but even I get caught up in it. My son is only 18 months so most stuff is gender neutral anyways. But you should have seen the looks when I said I'd gotten him a baby doll! (which I thinks help children learn to nurture). But even I stopped short at a dolls house. Oh...that's for girls...*sob*. Now I'm rethinking that. Oh my this has made my day! 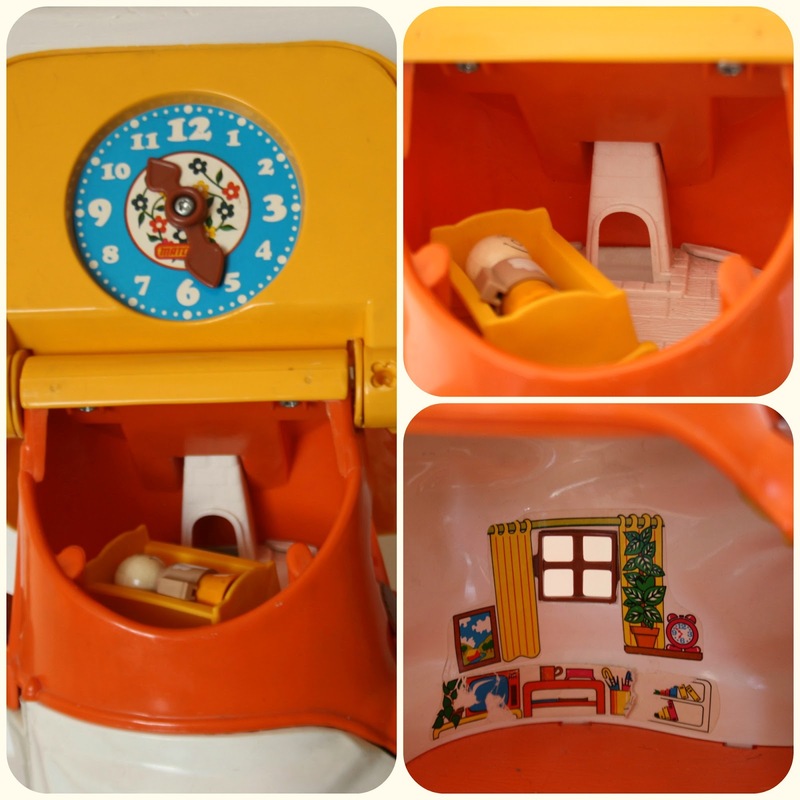 This was one of my favourite toys! My sister and I LOVED it. We were probably wearing brown cords and a yellow skivvy as well..hehee. I think my mum's still got it (I hope she does!) and can't wait to get it out when I have kids. Such a lovely discovery via Tabiboo. Gosh, I remember that boot very well! I don't think we had one, so I must have played with it at a friends' house, what a blast from the past. I so know what you mean about toys nowadays. When my daughter was little, it wasn't so bad. She is 14 now. But I do remember when she was about 4 or 5 they brought out pink lego...crazy! I remember this toy my daughters had it in the 80's. And it will be hiding in our attic somewhere. Thanks all for the brilliant comments! Lovely to read your thoughts and conversations with each other. My eldest (boy) loved pink, right up to the point when he hit school! And when the younger one (boy) wanted a pushchair to play with, I had the devil of a job trying to locate one that wasn't pink. Because pink was NOT his thing. I'm with you on the 'girlie' Lego and Playmobil. Why? That is an AMAZING toy, I just caught a glimpe of it when I was reading the post above and I swear my heart jumped! I love old toys ... vintage toys are so lovely, and the colors are amazing! Now I wish I had kept ours, I bought this boot for a couple of pounds for a Christmas or birthday present for one of my daughters, 15-20 years ago. I totally agree that toys now are far more sexist than when we were young.